U.S. Marshal Carrie Stetko tracks a killer in Antarctica, as the sun is about to set for six months. Russian Pilot: [about the vista] Amazing, eh? Russian Co-pilot: How much longer? Russian Pilot: Six and a half hours. Russian Co-pilot: Let's do this now. Russian Co-pilot: I want to get it over with. Q: Why does the ice make the drinks "boil"? Q: What is "Whiteout" about? 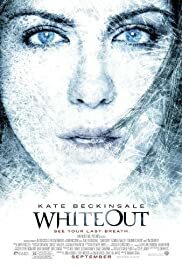 Q: Is "Whiteout" based on a book? I actually felt this movie was fairly decent. Looking at a lot of the reviews, people seem to feel so outraged at how horrible this movie apparently was, but I don't know what they were expecting. If you're that angry about the supposed "twist" foreshadowed in the trailer, then you should have been smart enough to know that the chances of this movie coming through with some amazing and original twist were very slim. Anyway, as for the film itself, there were definitely many flaws. That stupid shower scene in the first 10 minutes of the movie was so tactless I was almost ready to leave. The acting was mediocre at best. I think Gabriel Macht is an extremely good looking guy, but based on this film he is a horrendous actor. Kate Beckinsale was okay as the lead... She had her moments. The dialogue was so cheesy though. And the film was just also very predictable and tedious. The flashback scenes in particular got pretty annoying as pretty much the same exact scene was repeated at least 3 or 4 times throughout the movie. But perhaps the best aspect of the film is the scenery. The outside shots were beautiful. The whole idea of being on Antarctica was fascinating and is perhaps the main reason why I was able to put up with many of its flaws. I wish they developed that aspect of the story more. I also felt some of the blood and gore were also well done. It was more tasteful than a slasher movie but still just as gut-wrenching. 93 of 142 people found this review helpful. Was this review helpful to you?